To most people the Kootenays equate with powder, a lifestyle so consumed by the pursuit of fresh tracks that powder ranks up there with the other basic essentials of life: oxygen, water, food. To me, however, the Kootenays spell nostalgia. Though I have spent a large portion of my life chasing snow around the world, it’s right here at home in B.C. where some of my most formative wintry experiences transpired. Three particular experiences always bubble to the surface, touchstones in the murky, sometimes smoky, archives of my skiing life that are linked to three places in that region of the province now marketed by winter tourism promoters as the “Powder Highway.” Last winter I hit the road with Steve Ogle to revisit a few of these memories. It’s warm at the bottom of Red Mountain, unfortunately warm enough for drizzle instead of snow. I coax Steve over to the bottom of the Red Chair where a liftee stands forlornly wearing a black plastic bag over his ski jacket. Business is slow. I look upward at the vacant chairs that climb above the double-black moguls of The Cliff. At Red, a black diamond means something. We have a busy morning in the windy, wintry conditions up top. First we take a single cat ride to the top of Kirkup to sample some of Red’s affordable cat-skiing in the controlled and patrolled glades of Kirkup Mountain, finding fields of powder in sheltered trees there and, later, on adjacent Grey Mountain. Grey Mountain Chair wasn’t even a thought on anybody’s mind back when I ski bummed in Rossland in the early ’90s—back then Grey was a place only for backcountry skiers with skins. On our third ride up Grey, we share a chair with 60-something Mike Ramsey, a volunteer ski host originally from Toronto. Mike offers to show us some of his favourite stashes in an area on the back of Grey known as Chute Show. On the trail map, the zone is blocked out with ominous squiggly black lines, which seem to be some sort of shorthand for getting lost. Mike is an impressive skier, executing old-school stem christies, skis glued together with almost mono-ski uniformity in all kinds of snow conditions, from boot-top powder to wind-hammered crust. We follow him on a long obscure traverse through pecker-pole pines and finally arrive at a sign indicating the naturally gladed run called Ronnie’s, named after a friend of Mike’s who passed away recently. I could tell that, for Mike, skiing this run is a form of tribute. Mike is living proof that ski bums transcend age, income and race; they come in all forms. He was drawn to Rossland for the same reason I was 25 years ago, because of a deep skiing culture that seems as natural as the hot springs that bubble from the ground throughout the Kootenays. Similar to Southern Californian lawyer and developer Howard Katkov, who bought Red Mountain in 2004, who says it reminds him of the soulful place that Mammoth Mountain was when he was a So Cal skiing and surfing bum. “Red is something unique and special, and I feel more like a custodian than an owner,” Katkov tells me. After a burger and fries at the always boisterous Rafters Lounge, Steve and I ride up Red Chair in a drizzle that turns to wet snow. I’m determined to show him my old home run from the mists of time when I lived with a tree-planting buddy in his perpetually half-renovated heritage house in Lower Rossland, a short walk in ski boots across Cascade Highway from the back of Red. It was the closest I have ever come to ski-in living. The back of Red was a favourite finisher on powder days, albeit an illicit one. At the time I was a devout tele-skier, on- and off-piste. Today I’m happy to have fixed heels, as we duck under the rope, past a sign warning of dangerous hidden mineshafts. Full caveat: this is not something encouraged by Red Mountain Resort, but I am on a personal pilgrimage, a ridiculous one, I admit, given the conditions. The snow is virtually opposite to Red’s powdery rep. An unsupportable rain crust makes even jump turns difficult, but we pick our way down through the glades and I conjure up memories of faceshots. Half-buried mineshafts keep us alert. Steve watches as I stop to investigate a mineshaft filled with iced-over water. Childlike, I smash the ice with my ski pole and peer into the hole like a wishing well. Rossland is a town built on mining, and a love of skiing and the town’s mountain. Yeah, a Californian now owns it, but Rosslanders treat it like their own. 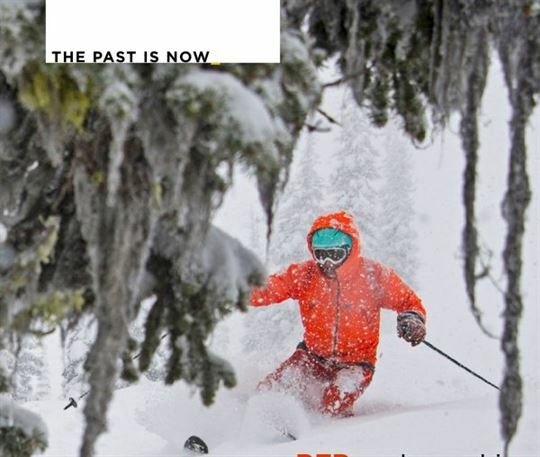 It was during my winter of ski bumming in Rossland decades ago—a halcyon time of few responsibilities that once experienced is never recaptured—that I realized skiing is much more than just one turn after another, but rather a lifestyle. Eventually we find our way to Cascade Highway, shoulder our skis and start walking—our jackets and ski pants now soaked. I pause to look over the bank into lower Rossland, hoping to recognize my old ski-in digs. No luck. A guy in a pickup stops to offer us a ride. We accept happily, and head into Rossland for a hot espresso in a warm place.